Converts hydraulic oil reservoirs from open breather systems to an expandable bladder system. Air in the system passes through a desiccant dryer, removing moisture and preventing corrosion. Introducing - A new technology for Protecting Hydraulic Oil and Gear Boxes. U.S. Patents and patent pending. Don’t just treat the problem. - Eliminate the source of the problem. Open hydraulic oil systems allow airborne contaminants including dirt and moisture to enter system through the breather vent port. This causes high humidity, condensation, free water accumulation, emulsified oil, sludge and acid formation and corrosion. This results in frequent oil and filter changes, high operating costs, downtime and shorted equipment life. Oil contamination causes over 85 percent of all hydraulic system failures. SEAL'N'DRY keeps hydraulic oil and equipment clean and dry. A desiccant cartridge absorbs moisture within the reservoir air chamber. SEAL'N'DRY creates a closed, dry environment above the oil surface 24/7. SEAL'N'DRY extends life of oil, filters and equipment. Substantially reduces operating and maintenance costs. It also reduces environmental contamination – a GREEN product. Each SEAL'N'DRY unit is a complete closed unit with a desiccant dryer cartridge, variable volume device, excess pressure and vacuum relief valve housed in a wall mounted lightweight HDPE housing. SEAL'N'DRY installs with one simple connection to the breather vent port of the oil reservoir. This replaces the vent cap and automatically converts the system from “Open” to “Closed”. Spin-On and Remote mounted units available. Once installed on a clean dry system SEAL'N'DRY may last for years without the need to change out the replaceable cartridge. SEAL'N'DRY can be provided for virtually any hydraulic oil or gear box from 1 to 1,000 gallons. Use selection chart or contact IRI for suggested size. Result: With SEAL'N'DRY installed frequent oil and filters changes become a thing of the past. 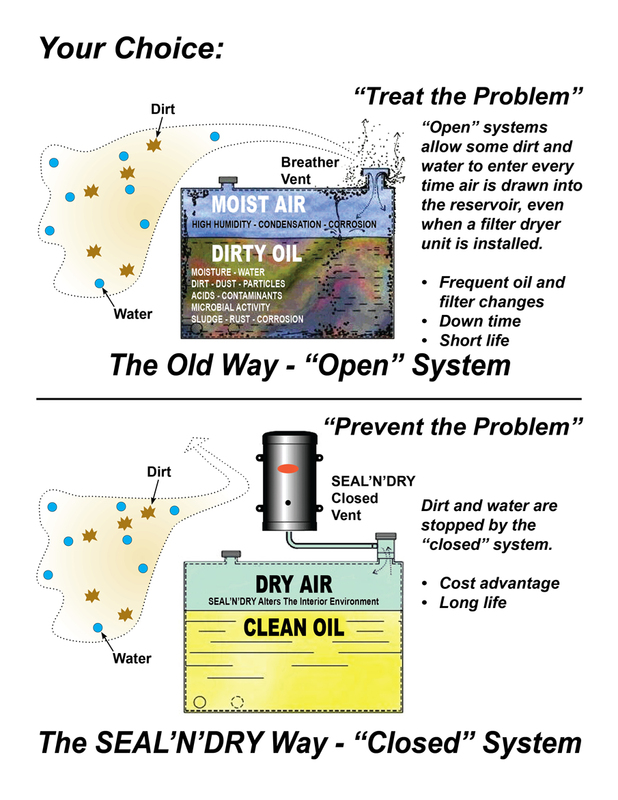 When the oil filter is changed, consideration can be given to a much higher efficiency filter . Fast turnaround for SEAL'N'DRY units for reservoirs sizes up to 200 gallons. Typical Pay-Back should be far less than a year and may only be a few months. Copyright © 2015 Inventive Resources Inc. | SEAL’N’DRY®. All rights reserved.